Kilpisjärvi Atmospheric Imaging Receiver Array: Lemmings! At one point we left the collapsed tile to go and deal with other parts of the site and then to get some food. 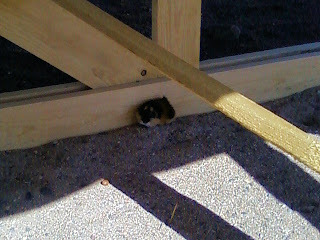 On our arrival back, we noticed there was a little visitor to the collapsed HBA tile. This is a lemming (Lemmus Lemmus). These small furry creatures (about 10cm long) are subnivean animals, meaning that they live at the layer where the snow meets the ground. As the snow has been melting we have noticed a few of their little tunnels at the ice-edges. There are actually a lot of these creatures about and we have seen many now. Although shy, I managed to get close enough to take the above picture, before it jumped over the timber and scurried away over the snow banks. Lemmings are probably most known from a famous computer game of the same name, where the player had to save these hapless creatures from disaster. Personally, I don't recall a level where you had to fetch them out from collapsing LOFAR HBA tiles.